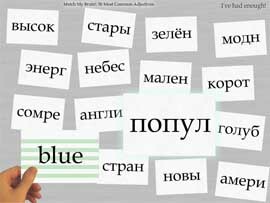 Flash My Brain - Accelerate your Russian studies with Flash My Brain flash cards. 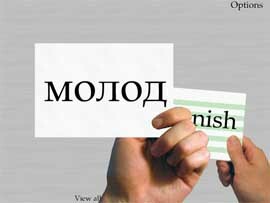 Accelerate your Russian studies with Flash My Brain flash cards. Studying Russian is a breeze with Flash My Brain Russian flash cards. You can select from the many existing Russian sets made by Flash My Brain users, or create your own. Then, you're ready to start learning the Flash My Brain way. Flash My Brain creates beautiful Russian flash cards, but it doesn't stop there. Upload mp3s of pronunciations to easily create talking flash cards. Flash My Brain can make great study materials for learning Russian. Share your work with your friends or students! 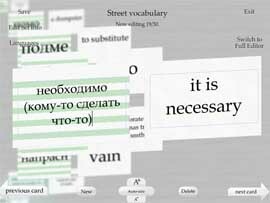 Buy Flash My Brain for $29.95 and start studying Russian the Flash My Brain way. Games that help you learn; editors to help you create; an environment that encourages personal expression - this is Flash My Brain!